t the SDHC, it matters to have a good description of the humanities. The Bod definition is one way to think about this abstract concept. But what are the “expressions of the human mind”? A look at Neither Wolf nor Dog by Kent Nerburn and Tatanka and Other Legends of the Lakota People by Donald F. Montileaux provides five concrete examples of what the humanities can express: literature, language, history, jurisprudence, and ethics. Literature: Nerburn gives us a creative nonfiction work, while Montileaux’s is an illustrated children’s book of legends. Language and linguistics: Both books are written in English, but Lakota is also present: the Montileaux book includes the text in Lakota while characters in Nerburn’s text speak off-page in Lakota. he South Dakota Humanities Council (SDHC), founded in 1972 in response to an act of Congress, is a 501(c)3 nonprofit and the only cultural organization in the state whose sole mission is to deliver humanities programming to the people of South Dakota. As a statewide advocate for the humanities, our mission is to celebrate literature, promote civil conversation, and tell the stories that define our state. We fulfill our mission by supporting and promoting public programming in the humanities like the Speakers Bureau; providing grant funding for community programs and research and discussion projects in our grants program; and hosting reading and literary programs like the annual Festival of Books, Young Readers Initiative and One Book South Dakota. I would like to have a conversation about a planned gift or putting SDHC in my will. Help us continue to unite readers and writers with a donation to our annual South Dakota Festival of Books and Young Readers Festival of Books. You can help where SDHC needs it most. An unrestricted gift can be used for operations expenses, programming and special initiatives. Students and adults take careful notes during a presentation by 2018 South Dakota Festival of Books author Laura Geringer Bass, an acclaimed writer of childrenâ&#x20AC;&#x2122;s books. Donations help fund Festival authors and events, as well as a variety of other South Dakota Humanities Council programs. id you know your donations help bring the biggest names in literature to South Dakota and bolster humanities programs in the state, supporting future readers and writers for generations to come? Since 2003, donor support has helped us feature Pulitzer Prize winner Timothy Egan, National Book Award winners Louise Erdrich and Tim Oâ&#x20AC;&#x2122;Brien, and many more at the South Dakota Festival of Books. The 2019 Festival will feature Heid Erdrich, Ojibwe poet and editor of New Poets of Native Nations; Alexander Heffner, host of the PBS show The Open Mind; and many other acclaimed authors. Help us add to this list of luminaries by making a Festival-specific donation today, or help secure the future of the South Dakota Humanities Council with a Legacy Pledge or gift to our Endowment or Unrestricted Fund. Many of our donors have chosen this option to make a gift to the SDHC in their will or estate planning. Mature stocks, life insurance policies, and IRA rollovers can easily be processed by our Community Foundation partners. Guarantee the future of our organization for the next generation. You can donate to endowment funds at Black Hills Area Community Foundation, South Dakota Community Foundation and/or Sioux Falls Area Community Foundation. onald F. Montileaux hopes Tatanka and Other Legends of the Lakota People will enlighten readers of all ages. “Wow. To receive news that I was selected out of so many wonderful authors and illustrators of children’s books, this was quite an honor,” Montileaux said. “The time one spends so that a finished book can be put into the hands of so many readers, which will influence many of all ages, is what one dreams of. To see that book in the hands of so many children is beyond words.” The 2019 Young Readers One Book, printed by the South Dakota Historical Society Press in Lakota and English, is a bind-in of three works: Tatanka and the Lakota People: A Creation Story, Tasunka: A Lakota Horse Legend, and Muskrat and Skunk: A Lakota Drum Story. Born in Pine Ridge, Montileaux is an enrolled member of the Oglala Sioux Tribe. He attended the Institute of American Indian Art in Santa Fe, N.M., and Black Hills State College in Spearfish, then worked for 22 years at the Rushmore Plaza Civic Center in Rapid City before becoming a full-time artist. War horses, buffalo, and warriors are the primary subjects of the award-winning Montileaux's art, all telling a story through the use of movement, color and positioning of the subject with colored pencils and India ink. In September 2014, Montileaux was inducted into the South Dakota Hall of Fame as a Champion for Excellence, Arts & Entertainment Artist. ent Nerburn is humbled and excited that his popular book will be discussed by all of South Dakota. Neither Wolf nor Dog, which is told from a multicultural perspective, won the Minnesota Book Award and was made into a feature film in 2016. “In Neither Wolf nor Dog I tell the story of three men — two Native and one non-Native — as we journey through a world too often hidden and too little understood, and struggle to see the world through each others’ eyes,” he said. “I hope readers who share this journey will learn something of our complex and difficult intertwined histories and reflect on what it means to go forward as common children of this common land.” Born and raised near Minneapolis, Nerburn earned a bachelor’s degree at the University of Minnesota in American Studies. He went on to study humanities and religion at Stanford University before earning a doctorate in religious studies and art at the University of California at Berkeley. Originally a sculptor, Nerburn became a writer to reach broader audiences with his work. After spending 25 years in northern Minnesota, Nerburn and his wife now live near Portland, Ore. A two-time winner of the Minnesota Book Award, Nerburn has written 14 books on spiritual values and Native American themes, inspired by his work on the Red Lake Ojibwe reservation helping students collect memories of tribal elders. About SDHC’s One Book South Dakota, Young Readers One Book Programs Since 2003, the annual One Book program has encouraged South Dakotans to read and discuss the same book. The Young Readers One Book program began in 2014 to encourage youth reading and combat summer reading loss. •	Napoleon Dynamite producer & childrens author Sean Covel with illustrator Rebecca Swift •	Powwow Summer author Marcie Rendon •	2019 Young Readers One Book author and artist Donald F. Montileaux •	Many More TBA! The South Dakota Festival of Books and Young Readers Festival will feature presentations, discussion panels and more Oct. 3-6, 2019 in Deadwood and Rapid City. Visit our website for more. he South Dakota Humanities Council awards grants to nonprofit organizations in South Dakota through community project grants of up to $7,000 for humanities-related projects and events, providing vital and educational cultural programming for communities. Review grant guidelines and information and apply online at sdhumanities.org. Direct questions to grants@sdhumanities.org or (605) 688-6113. Guidelines are subject to change; visit the website to stay apprised. SDHC grants over $1,000 (also known as “Major” grants) support miscellaneous expenses such as bussing costs for student cultural trips, scholar appearances at community conversation events, documentary films, and educational programs. They’re divided into two categories: discussion and research. Funds conferences, lectures, presentations, festivals, and symposiums that engage people in humanities discussion, up to $7,000. Programs must examine the topic from the view and perspective of the humanities and use various forms of media to advance that effort. Short Grass Arts Council in Pierre received a grant from the South Dakota Humanities Council to host Japanese drum group “Ondekoza” in February 2018. Non-profits throughout South Dakota can apply twice a year for SDHC grants that fund discussion and research projects. Photo by Keith Hemmelman of Pierre. Apply to host a One Book SD reading group at sdhumanities.org. Your $50 application fee will get you up to 30 copies of Neither Wolf nor Dog from our Lending Library and, if you’d like, an SDHC scholar to lead your group discussion. 1. Book Club to Go - Borrow one of our titles for your book club 2. One Book SD - Borrow our current One Book for your book club 3. Speakers Bureau - Bring a scholar to your community to lead your group in one of the two above options, or to speak on a variety of topics (see opposite page). DHC scholars are available for Speakers Bureau programs, including Chautauqua performances and expertise-based presentations that allow audiences to learn about various topics. They can also lead book discussions at community events for a variety of organizations. The key below indicates the types of programs available from each scholar. SDHC scholars present programs on topics for all ages and backgrounds, with nearly 150 Speakers Bureau events annually. Contact the scholar(s) to confirm availability and program for your event. At least four to six weeks before your program, file an online application at sdhumanities.org. Select One Stop Programs to find the online application. Submit your application to the SDHC with the $50 fee. The coordinator and scholar(s) will receive follow-up information from the SDHC office. Promote your event! Be sure to acknowledge the SDHC and NEH in your promotions. ll scholars are available for Speakers Bureau presentations, unless otherwise noted. Many also lead One Book or Book Club to Go discussions. See key above to find the correct type of scholar for your program. Chautauqua performers —­­­ historical re-enactors and other performers who impersonate famous figures — are also designated. Host your event! Be sure to welcome your scholar and thank the SDHC for program support. Complete the evaluation and submit to the SDHC office within two weeks of your event. 29615 469th Ave, Beresford, SD 57004 mcarlson@iw.net | 605-957-4371 A River Runs through It: The Missouri River Is an Enigma Aronson discusses how modern technology has tried to tame the mighty Missouri River and harness its energy to meet the growing needs of the people in the Missouri River Basin. She explores the building of the six giant dams on the Missouri River and which groups benefited most and least from the flood control projects. Aronson believes that the Missouri River eludes the efforts of modern technology to tame it fully, and it continues to provide water of uncertain quantity and quality. Q&A period will follow. Professor Emerita of History Saint John’s University/College of Saint Benedict 1225 LaSalle Ave Apt 1307, Minneapolis, MN 55403-2331 aatkins@csbsju.edu | 612-204-1955 American Women and American History In the 2020 centennial year of the Woman Suffrage Amendment to the Constitution, Adkins examines women and the vote, women and politics, women and American history: who have they been and why were they that? It’s a political story worth exploring. Writing Specialist	Presentation College	1105 N Main St Apt 4, Aberdeen, SD 57401	kieraaball@gmail.com | 763-486-8508 Finding the Sublime in the Prairie: Pastoral Literature and Midwestern Regionalism in Gilead Ball adapts her conference paper on Marilynne Robinson’s Gilead; she explores the unique beauty found on the prairie and in small prairie towns. This presentation could be adapted to a discussion format, as well, and expand beyond this particular novel. 4349 Red Cliff Ter, Rapid City, SD 57702 mollybarari@gmail.com | 308-440-0047 Heirlooms: Creative Life Writing for Adults Barari helps adults identify important life memories and record their stories onto paper through fun hands-on activities. Creative writing has many benefits aside from preserving valuable memories. It helps sharpen the mind and provides a therapeutic outlet for emotions. Barari asks participants to bring writing materials to the workshop. “Miss V” the Gypsy Cowbelle interacts with children at a music and ice cream social event July 15, 2018 (National Ice Cream Day) at the Granary Rural Cultural Center in Rural Groton as part of a program by the Groton venue and Dacotah Prairie Museum in Aberdeen. Photo courtesy of Marianne Marttila-Klipfel, museum curatorial assistant. Speaker	25627 484th Ave, Garretson, SD 57030	vkboyd.1956@gmail.com | 605-594-6731	Journey into the Past Boyd introduces three American Indian tribes — Omaha, Ponca and Ioway — and their life in what is now Southeastern South Dakota. These people had large villages and trade sites and were farmers as well as hunters. Artifacts, samples of trade items, replicas of a dog travois, garden tools and pottery used are discussed and exhibited. Associate Professor of History, USD	306 Lewis St, Vermillion, SD 57069 Scott.Breuninger@usd.edu | 605-658-3338 The Common Good and the Liberal Arts Breuninger contends one of the lasting legacies of the founding fathers was respect and support for the “common good” among all American citizens, and that while they’re frequently a target of recent commentators who suggest that history (and the liberal arts in general) should be overshadowed by disciplines with more “practical” applications, the study of history plays an essential role in this process. This lecture will focus on how engaged citizens in today’s increasingly global world need to have an appreciation for history that has shaped their lives and a greater sense of their responsibilities and duties to the common good. Museum Manager, Dakota Discovery Museum 1300 McGovern Ave PO Box 1071, Mitchell, SD 57301 robrown@dwu.edu | 605-770-8493 Discovering Dakota: A People & Land of Infinite Variety Everyone comes from somewhere and everyone’s story is worth telling and hearing, according to Brown. His questions are where did we come from? Why did we come here? What have we done since coming here? What are we building for the future? http://www.phylliscoledai.com/ Author, Public Speaker 712 6th St, Brookings, SD 57006 phyllis@phylliscoledai.com | 605-592-6293	The 1862 Dakota Uprising through Sarah Wakefield’s Eyes Cole-Dai explores the 1862 Dakota Uprising in Minnesota from the perspective of Sarah Wakefield, who was captured with her two young children on the first morning of the outbreak. Later she would be rumored to have loved Caske, her Dakota captor and protector. In the war’s aftermath, a military tribunal sentenced Caske to death for crimes against white civilians. Perhaps owing to Sarah’s testimony in Caske’s defense, President Lincoln issued an order sparing his life. Yet Caske was among the 38 Dakota warriors hanged in Mankato, Minn. on December 26, 1862. Assistant Professor, USD	2427 Princeton Ave, Vermillion, SD 57069 Dyanis.Popova@usd.edu | 540-597-4758	Culture and Schooling Conrad-Popova believes that the way students read and understand the world and their connection to society and community is heavily shaped by their life experiences and their social identities. A welcoming and inclusive school environment can create space for student growth. ConradPopova explores the intersections of culture and schooling in the U.S. and provides educators with time to reflect on and shape a schooling experience that recognizes and celebrates the experiences and cultures of all students. Speaker 408 Calumet Ave NE #37, De Smet, SD 57231 mariancramer@yahoo.com | 605-270-4904 Laura Ingalls Wilder, Family and Friends Cramer discusses Laura Ingalls Wilder’s life with her family and friends in De Smet, including information from 11 oral histories of people who knew Laura and the Ingalls and Wilder families. Longtime South Dakota Humanities Council Speakers Bureau scholar Marian Cramer discusses Laura Ingalls Wilder during a 2018 presentation. Courtesy photo. Professor Emeritus, BHSU 1750 College Ln Lot 13, Spearfish, SD 57783	jace.decory@bhsu.edu | 605-722-8648 Lakota Beliefs and Cultural Sustainability Participants will appreciate the philosophy and values of the Lakota people through traditional Lakota concepts and cultural mapping taught by DeCory. She focuses on building bridges of cultural understanding. http://www.ldiggs.com/index.html 104 West Carlton Ave, Roslyn, SD 57261 public@ldiggs.com | 605-486-4536 Bringing People Together Diggs explores recent research showing that, when people’s fight or flight response is activated, the part of their brain that is responsible for empathy shuts down. This research suggests that people must find a way to feel something different about each other before they can think positively about each other. Diggs addresses subtle and unseen barriers in people’s daily lives that make it difficult to feel or think positively about each other, despite wanting to do so. He explores the research and suggests approaches to getting people to feel differently about each other. Counselor, Writer, Educator, and Consultant 721 S Euclid Ave, Sioux Falls, SD 57104 dradilenschneider@gmail.com | 605-906-5404 Healing Our Shared Past, Present, and Future: The Hiawatha Indian Insane Asylum Dilenschneider discusses the Hiawatha Asylum in Canton (best as a combined presentation with fellow humanities scholar Jerry Fogg). Calling it the linchpin of federal “Indian” policy, Dilenschneider discusses her research on how, from 1902-1933, 400 Native Americans who misbehaved in boarding schools or who angered reservation agents were incarcerated at the institution. Dilenschneider says the story has been virtually unknown until recently. https://www.pegiedouglas.com/ Musician, Composer, Storyteller Box 925, Hill City, SD 57745 pegiedouglas411@gmail.com | 919-414-9383 The Life and Music of Badger Clark: South Dakota’s First Poet Laureate This program is a one-hour show including narration about Badger’s life interspersed with his poetry set to music. Douglas plays guitar and sings. Reference and Instruction Librarian Northern State University 1201 3rd Ave NE #A112, Aberdeen, SD 57401 kristin.echtenkamp@northern.edu | 605-626-7774 Understanding and Sharing Information in the Age of Social Media Echtenkamp says facts aren’t always the basis for public opinion and people are often swayed by appeals to their emotions and diverse personal belief systems. She says it’s important to apply evaluation skills to life to ensure positive and professional interactions. In her presentation, she showcases tools and strategies to help the audience navigate today’s socially and politically charged information climate. Interactive activities will help participants practice these skills to find and interpret quality information. Christopher N. Jass, Ph.D., curator of Quaternary Paleontology at the Royal Alberta Museum, stands in the new Ice Age gallery at The Mammoth Site in Hot Springs. Dr. Jass spoke at The Mammoth Site’s Annual Meeting about “Building a New Royal Alberta Museum-Challenges, Successes, and Lessons Along the Way.” Photo courtesy of the Royal Alberta Museum. who as a 17-year-old boy helped capture the three Younger brothers of the Jesse James outlaw gang. As the Younger brothers in Stillwater Prison still had friends on the outside who would “deal with him,” Sorbel disappeared. He would later reappear in Webster and spend the rest of his life as the eminent area horse doctor, harboring his secret until he died in 1930. Writer 705 S Phillips Ave, Sioux Falls, SD 57104 wfanebust@gmail.com | 605-496-8730 Chasing Frank and Jesse James Fanebust tells the story of their improbable escape through southwestern Minnesota, Dakota Territory and Iowa following the botched bank robbery at Northfield, Minn.
https://www.facebook.com/NativeSoulArt Cultural Historian & Artist 1405 E Walnut St, Sioux Falls, SD 57103 jerryfogg@sio.midco.net | 605-254-8189 Healing Our Shared Past, Present, and Future: The Hiawatha Indian Insane Asylum See description on page 7 (presentation is best combined with fellow humanities scholar Anne Dilenschneider). Independent Scholar	2811 Tierra Dr Apt 107, Lincoln, NE 68516 joyzellegodfrey@gmail.com | 402-613-1200 Storytelling of the Dakota This presentation demonstrates the historical society of the Dakota people through the medium of storytelling. The adventures of the first set of twins born in the world will give a glimpse of the family structure, food gathering and beliefs of their tribal people. Pegie Douglas presents “The Life and Music of Badger Clark” at the Vermillion Public Library in July 2018. Photo by Rachelle Langdon, Public Relations and Programming Specialist. Attorney 306 E 82nd Pl, Sioux Falls, SD 57108 prairiewrite@gmail.com | 605-361-7289 South Dakota’s War against German Gebhart says that as the U.S. entered World War I, South Dakota wasn’t immune from the anti-German sentiment growing across the country. In fact, one government agency, the state Council of Defense, viewed speaking German as such a threat to public safety that it made teaching and speaking the language illegal. He discusses the efforts and effects of that entity mounting what was essentially a war on the German language. Speaker 832 Fairview Dr, Belle Fourche, SD 57717 gilbert@rushmore.com | 605-641-5642 Crow Dog Gilbert examines the legal and social history of the prosecution of Lower Brule Elder Crow Dog for the death of Spotted Tail. Gilbert discusses Crow Dog’s incarceration in Deadwood for over two years, during which time he became a part of the fabric of Deadwood society, and his life after the legal battle was over, including his actions in the days leading up to the Wounded Knee Massacre. Dakota Daughters This play consists of three monologues representing the perspectives of women from the Native American, AfricanAmerican and Euro-American cultures who tell their accounts of actual events in the west from 1865 to 1890 that led up to the Wounded Knee Massacre. Events include the Fort Laramie Treaty, the Battle of the Little Big Horn or Greasy Grass, the Dawes Act and the Ghost Dance, and the death of Sitting Bull. The audience is invited to a postperformance discussion of conflicting historical accounts. Professor Emeritus, SDSU 216 Sundance Pass, Brookings, SD 57006	nels.granholm@sdstate.edu | 605-692-6416 Protecting Our World with Native American Philosophies Native American authors elaborate fundamental principles on how to live honorable lives of reciprocity with one another and the natural world. Granholm recommends contemplating these notions of reciprocity and embracing them if worthwhile and practical. Granholm will examine aboriginal themes discussed by Robin Wall Kimmerer in her 2013 book Braiding Sweetgrass: Indigenous Wisdom, Knowledge, and The Teachings of the Plants. www.gypsycowbelle.com Performing Artist PO Box 809, Thermopolis, WY 82443 gypsycowbelle@gmail.com | 307-231-9252 Homespun Instruments Miss “V” encourages creative expression and fosters positive group dynamics with simple homemade instruments. After a brief overview, participants “join the band” as Miss “V” leads traditional folk, cowboy and classic country tunes in a popular workshop for all ages that has been well-received at folk festivals and other community events. https://www.sdstate.edu/directory/karla-hunter Associate Professor of Communication Studies, SDSU 433 Telluride Ln, Brookings, SD 57006	Karla.Hunter@sdstate.edu | 605-212-0894 Building Effective Teams Hunter’s interactive workshop brings together research, discussions, and activities to help work teams harness the strengths and mitigate the weaknesses of diverse workstyles and achieve a task/relationship balance. The program is especially suited to adult learners such as civic organizations or college students. Presenters and event organizers participate in a “round dance” at the SDHC-sponsored Second Annual Indigenous Writer’s Festival: “Celebrating Native Women” held in Rapid City June 22-23. Courtesy photo. Auschwitz, the Holocaust, and Memory: Doing Research at a Nazi Concentration Camp Hicks will discuss his latest novel, The Commandant of Lubizec, which is based upon Auschwitz and the other Operation Reinhard camps. He’ll read passages from his novel, show photos of the camps, and talk about visiting Auschwitz. Moccasin Paths: Not 1492 and Not by Columbus James educates the public on misleading information about the discovery of America she says she learned many years ago. She analyzes falsehoods behind quotes she was taught in school, like “from one sovereign nation to another” in National Geographic to “in 1492 Columbus sailed the ocean blue.” She discusses claims that Columbus “discovered” our land and that Europeans were bringing “enlightened” civilization to an unpopulated land. James says democracy came in the form of the Iroquois Great Law of Peace and from a man who was born in the Mohawk territory where James’ tribe is located. www.yvonnehollenbeck.com 30549 291st St, Clearfield, SD 57580	geetwo@gwtc.net | 605-557-3559 Patchwork of the Prairie Hollenbeck presents a trunk show and PowerPoint presentation involving five generations of family quilts made on the prairies of South Dakota and Nebraska. www.paulhorsted.com Photographer/Author	24905 Mica Ridge Rd, Custer, SD 57730 paul@paulhorsted.com | 605-673-3685 The Black Hills Yesterday & Today From the 1874 Black Hills “Custer” Expedition through the gold rush, to the early days of tourism, Horsted shows rare historic photographs carefully matched with contemporary views from the same locations. His fascinating “then and now” images reveal insights into history, development, ecology and more across the Black Hills region. We encourage Speakers Bureau scholars to apply each fall for the following year. 2019 scholar applications will be available in October at www.sdhumanities.org. Scholar 511 S Arch St, Aberdeen, SD 57401 prairielitdocbj@aol.com | 605-229-5988 South Dakota Stained Glass Johnson gives a visual and historical review of the stained glass in South Dakota. The presentation will focus on the different types of stained glass in the community where the PowerPoint is given. Also included is a brief pictorial review of significant stained glass installations in the state. Historian 220 W Main St Apt 316, Waukesha, WI 53186 rpjones@ameritech.net | 262-366-3803 A Century Celebration: Woman Suffrage in South Dakota 1868-1918 Celebrating the century birthday of Woman Suffrage in South Dakota in 1918 and throughout the United States in 1920, this program reviews the key moments, key individuals, and key issues that helped women achieve their equal voting rights in the United States, and more specifically, in South Dakota one hundred years ago. Speaker PO Box 222, Hot Springs, SD 57747 rckaan@gmail.com | 605-440-1007	Black Hills Stagecoach and Freight Wagon Routes Kaan examines the political, cultural, and economic issues affecting the stagecoach and freight wagon routes into the Black Hills from Cheyenne, Wyo. and Sydney, Neb. using timelines, maps, original photos and satellite imagery. Independent Historian 1020 W Clark St, Vermillion, SD 57069	abninf504@hotmail.com | 605-670-7961 The Indian Reorganization Act Kingfisher explores the landmark legislation, how it was drafted, and its impact on South Dakota tribes. While often seen by non-Native scholars as a boon to tribes, Kingfisher says it in fact undermined tribal sovereignty and cultural norms with the creation and imposition of tribal governments. Regardless of this, it is still the foundation of federal Native policy. Scholar applications are reviewed by a committee of SDHC board members. To be included on a list for 2019, call (605) 688-6113 or email info@sdhumanities.org. The committee reviews scholar applicants’ academic background and presentation experience combined with their knowledge of humanities subjects relevant to South Dakota. www.allenandjill.com	Aj Productions, LLC 25353 S Lightning Crk Rd, Custer, SD 57730 kitrkhammusic@icloud.com | 605-440-7338 History of Traditional American Western Music The Kirkhams discuss and play (on acoustic guitar, bass fiddle, mandolin, and harmonica) public domain traditional Western music from 1870-1907 (trail drives and Black Hills mining era, Badger Clark era), including classic, contemporary, and original western. They share background and history on the songs to educate audiences about music popular during the 1881 Courthouse era and music of the American West. Western Music includes songs of the Black Hills, valleys, pine trees and plains, cowboys and cowgirls, horses and cattle, pioneer families, gold miners, ghost towns, Native Americans, outlaws and gamblers. Speaker 1209 Madill St, Keystone, SD 57751 jeaniekirkws@gmail.com | 515-598-6382 Carrie Ingalls Swanzey: An Ingalls in the Black Hills Kirkpatrick examines Carrie’s life after high school until her death in 1946. Three main stages in her life will be examined: working woman, feminist and stepmother. Reference and Instruction Librarian Northern State University 1207 S Main St, Aberdeen, SD 57401	lynn.klundt@northern.edu | 605-626-7773 Understanding & Sharing Information in the Social Media Age Klundt says facts aren’t always the basis for public opinion and people are often swayed by appeals to their emotions and diverse personal belief systems; therefore, evaluation skills are necessary to ensure positive and professional interactions. She offers tools and strategies to help the audience navigate today’s socially and politically charged information climate. Interactive activities will help participants practice these skills to find and interpret quality information. Kyle Rosfeld, a Cody, Neb. bootmaker (far right), helps customers during the Dakota Western Heritage Festival in Ft. Pierre. The Dakota Daughters perform at a 2018 SDHC Speakers Bureau event. The group consists of historical interpreter Geraldine Goes In Center (middle) Joyce Jefferson (right) and Lillian Witt. Photo by Shirley Bernie. Adjunct Assistant Professor SDSU Dept. of Sociology and Rural Studies 1124 4th St, Brookings, SD 57006	mjblee@mchsi.com | 605-692-8252 Amidst Bombings and Blockades: Four Community Studies in Yunnan Province that Shaped Worldviews of China Lee examines four community studies completed in China’s Yunnan Province during the 1930s and 1940s at the height of the Sino-Japanese War. The scholars who conducted these studies were largely unknown to each other but strongly influenced by social anthropologist Bronislaw Malinowski. Forced into one small corner of China not occupied by the Japanese and working under the most challenging conditions, they produced studies that shaped outsiders’ perspectives for decades and are still regarded as exemplary by sociologists and anthropologists worldwide. www.B4KProgram.org CEO, Books 4 Kids Program PO Box 385, Arlington, SD 57212 Books4Kids@PublishPS.com | 605-783-7715 A Fairy Different Life Liebsch begins this session by reading her book, A Fairy Different Life. Listeners enjoy that the story is written in verse, and the underlying message of anti-bullying strikes students in a way that makes them look to their own behavior, rather than the behavior of others. After the reading, Liebsch, a.k.a. “Goob,” tells the story of how she participated in bullying as a child. She shares the regret she still carries as an adult because of her actions and even ties her nickname into the presentation to help young students understand bullying. From Wentworth to the Western Front: The World War One Odyssey of Private John Warns (previously entitled “Over Here, Over There: The World War One Correspondence of the Private John Warns Family”) Lofthus says World War One is the event that set the stage for the modern world and transformed the United States from an isolationist promised land to a crusading state willing to go to war for ideological reasons. Lofthus examines the war front and home front from the perspective of Private John Warns’ family correspondence, placing it in the wider context of the era. He reveals the dramatic extent to which rural America was drawn into the maelstrom of events surrounding World War One. tomodayproductions.com CEO/Owner, Tom O’ Day Productions 2821 Rocky Rd #115, Cody, WY 82414 tomodayproductions@bresnan.net | 307-527-7314 Tom O’Day Maple gives a Chautauqua presentation as the outlaw Tom O’Day, who had many experiences in western South Dakota at Belle Fourche, later retiring and passing away in Timber Lake in 1930.
www.billmarkley.com Author 803 Bridgeview Ave., Pierre, SD 57501 markley@pie.midco.net | 605-224-5322 A Search for Truth in the Old West Who wanted Crazy Horse killed? Were Wild Bill Hickok and Calamity Jane lovers? Did Buffalo Bill ride for the Pony Express? Who fired first at the gunfight at the O.K. Corral? Could Custer have survived the Battle of the Little Big Horn? Were the cattle barons justified starting Wyoming’s Johnson County War? Why did the James-Younger Gang raid Minnesota’s Northfield Bank? Markley presents both sides of these and other topics he and co-author Kellen Cutsforth researched for their 2018 book Calling Down the Thunder: A Search for Truth in the Old West. Host a minimum of 15 people and provide a space with comfortable accommodations. Allow approximately 45 minutes plus Q&A. Musician 2609 Mulligan Dr, Yankton, SD 57078-5306 oisins_remnant@yahoo.com | 605-664-7672	Cowboy Nighthawk Tunes of the Great Northern Plains While on the market trails to the rail heads of Western Kansas, cowboys coming from Texas would stand their night watches (nighthawk) singing to bedded herds of cattle. As McDonald explains, singing nighthawk tunes to cattle was a valuable tool for North American cowboys — like a sturdy length of rope or a skilled cow pony. This program includes the nighthawk tunes of Robert V. Carr, E. A. L. Griffin, E. A. Brininstool, Arthur Chapman and Badger Clark. https://www.sdstate.edu/directory/jason-mcentee Professor, Department Head, SDSU English Dept 208 Lincoln Ln S, Brookings, SD 57006 jmac53@hotmail.com | 605-697-8019	Strangers in Their Own Land McEntee examines Iraqi Freedom movies in the context of the warrior’s homecoming. He analyzes the “coming home” narrative and studies warrior trauma, readjustment, and repatriation as seen in movies. https://wrhcsd.wordpress.com/ Secretary-Treasurer West River History Conference, Inc. 1327 State St, Rapid City, SD 57702-3425 lhnrcservices@gmail.com | 605-786-3344 Wild Bill, 10 Cents and Westward Trailing Fascinating Old West characters like Wild Bill, Buffalo Bill, and Calamity Jane were introduced to the world through the dime novel phenomenon. What was the impact of the sensational information and heart-stopping stories of these popular novellas, many themed on the West? Neubert looks at dime novel heroes, authors and purveyors that impacted westward settlement and cultural expectations then and now. www.jeanpatrick.com Author 40519 258th St, Mitchell, SD 57301 jean@santel.net | 605-770-7345 Dynamite and Determination: The Carving of Mount Rushmore Using old photographs and carving tools, author Jean L.S. Patrick presents unique facts and perspectives about Mount Rushmore and sculptor Gutzon Borglum. This presentation can be adapted to meet the needs of any age group or audience. It also works well for South Dakota history units in schools. Democracy under Siege: Where Are We Headed and What Can We Do about It? Miller says America was once a beacon of freedom and democracy but is now under siege, facing the same struggles as its counterparts around the globe. He lists challenges to the future of democracy in the U.S., including fading civic education, journalism in free fall, the decline of community and civility, excessive money in politics, leadership deficits, loss of faith in institutions and leaders, political polarization, official lying and loss of integrity, governmental dysfunction at the highest levels, and many others. Miller will also discuss ways to counteract these forces and bolster democratic tradition. Writer PO Box 586, Spearfish, SD 57783 marsha.mittman@thenextfoundation.org | 605-644-8062 So You Want to Write ­— What Next? Mittman, a published author, will show audience members how to get started, hone their craft, and find places to publish their work. Cowboy Poet Hazyn Sherer of Draper, S.D. (far left) performs at the September 2018 Dakota Western Heritage Festival in Ft. Pierre as Carmen Cowan Magee and Willie Cowan (far right) look on. This photo and page 11 photo are courtesy of the Dakota Western Heritage Festival. Artist	Box 555, Pierre, SD 57501 jpollock@pie.midco.net | 605-224-2767	Soldier Artists and the Vietnam War From August of 1966 to January of 1970, the U.S. Army sent teams of artists with their sketchbooks and paintbrushes into the war-torn fields of Vietnam as part of the U.S. Army Vietnam Combat Artist Program. South Dakota artist James Pollock was one of the 46 artists who participated in the program. Using a digital slideshow, he provides a historical overview of the army’s Vietnam soldier art program, along with art examples of his own and from the other 45 soldier artists. Pollock gave his first presentation at the U. S. Library of Congress in Washington, D.C., in 2003. Original art for images used in the presentation is in the permanent U. S. Army Art Collection in Belvoir, Va.
217 5th Ave East, Sisseton, SD 57262 janeandjohnrasmussen@gmail.com | 605-237-6004 The Stavig Letters The immigrant experience comes to life in this threeperson readers theater program created by Dr. Wayne Knutson. Content comes directly from an extensive collection of letters written over a 50-year period between two brothers, one who immigrated to Dakota Territory and one who stayed in Norway. http://heartoftheprairie.net/ President, SD State Poetry Society 16894 SD Hwy 47, Seneca, SD 57473 bbroseland@venturecomm.net | 605-436-6770	Cowman This program is a memoir of life in South Dakota by a fourth-generation rancher who explores connection to the land and what binds people to it. usd.edu/faculty-and-staff/Molly-Rozum Ronald R. Nelson Chair of Great Plains and South Dakota History, USD 2323 East Main St, Vermillion, SD 57069 mprozum@midco.net | 605-670-3177	Votes for Women: 100 Years of Woman Suffrage in South Dakota Rozum will discuss the general history of the woman suffrage movement in the state, the roles of individual suffragists, themes important to the success and failure of woman suffrage, and the work of national touring suffragist lecturers in the state, associated with the National American Woman Suffrage Association (the organization of Susan B. Anthony, Elizabeth Cady Stanton, Carrie Chapman Catt and Anna Howard Shaw). Rozum will relate the movement in South Dakota to national and regional patterns in the struggle to win the vote for women, finally achieved in 1920 with the ratification of the 19th Amendment to the U.S. Constitution. www.jimreese.org Writer, Editor, Prison Advocate	Mount Marty College, National Endowment for the Arts 611 Augusta Cir, Yankton, SD 57078	james.reese@mtmc.edu | 605-668-1362	Connecting with the Criminal in Your Classroom – 10 Years in Prison and What Inmates Teach Me As one of five artists-in-residence throughout the country who are part of the National Endowment for the Arts interagency initiative with the Department of Justice’s Federal Bureau of Prisons, Reese established Yankton Federal Prison Camp’s first creative writing workshop and publishing course, editing a yearly (perfect bound) journal, 4 P.M. Count, which features creative writing and visual artwork by inmates. His presentation provides current and historical context about incarceration in the United States and examines the effects of programs like his. Scholar Donovin Sprague presents an SDHC Speakers Bureau program, “Era of the Lakota-French Fur Trade from the Missouri River to the Black Hills,” during Preservation Thursday at the Homestake Adams Research and Cultural Center in Deadwood in October 2018. Photo by Deadwood History, Inc., Homestake Adams Research and Cultural Center. Independent Scholar 2320 Westwind Dr, Ames, IA 50010 phyllis_schrag@mediacombb.net | 515-337-1713	Letters from the Attic Participants will gain a perspective on the life and times of people who settled in Dakota Territory. The presentation, which includes a PowerPoint, is based on 50 letters written in German Script addressed to Schrag’s great-grandfather, FJ Meier. These letters had been carefully saved, never translated, and handed down through the generations; they detail faith, personal experiences, and the agrarian nature of Dakotans between 1878 and 1889.
https://www.tie.net/scott-simpson Learning Specialist, Technology and Innovation in Education 821 N 8th St, Spearfish, SD 57783	ssimpson@tie.net | 605-641-4289	Cultural Reconnection through Story Simpson celebrates the “literature” of the oral tradition of the Lakota/Dakota/Nakota people of our state. He teaches the combined practice of journaling/reflecting and guided circle conversations to promote civil discourse. The program will help to promote and support the Lakota, Nakota and Dakota stories that define our state by bringing the voices of the elders to the forefront through video. The elders share both traditional stories and personal stories of loss, love, wisdom, perseverance, and joy. The video interviews resonate powerfully with individuals, Native or non-Native, and provide opportunity for productive conversations to create a more peaceful and understanding world. Professor Emerita SD School of Mines & Technology	4904 Galena Dr, Rapid City, SD 57702 jujusneller@gmail.com Look Who’s Laughing: The Power of Humor Sneller explores the role and power of humor in our everyday lives. Although humor isn’t something we often take seriously, it has powerful sociological, psychological, political and philosophical ramifications. From our morning newspaper comics to TV sitcoms to funny movies, humor is all around us, and often without our realizing it, influences the way we look at our world. www.wolakotaproject.org	Learning Specialist, Technology & Innovation in Education 1925 Plaza Dr, Rapid City, SD 57702 ssteever@tie.net | 605-394-1876 Cultural Reconnection through Story See description, below left, under Scott Simpson. www.christinestewartnunez.com Professor of English, SDSU 824 9th St, Brookings, SD 57006 christine.poetscholar@gmail.com | 605-691-3714 Appreciating Contemporary Poetry Stewart discusses the elements of poetry — imagery, sound tension, and space — in the work of South Dakota poets publishing today. Professor of History Presentation College 1003 N 4th St #2, Aberdeen, SD 57401	brad.tennant@presentation.edu | 605-229-8577	South Dakota during the Progressive Era Tennant discusses events occurring in South Dakota within the period known as the Progressive Era. Topics include the 100th anniversary of women’s suffrage in South Dakota, political figures like Peter Norbeck, the impact of the Populist Movement, and legislation regarding the state’s economy, workers, education and tourism. The program is intended for high school students and the general public. http://www.imagesoftheworld.com/ Images of the World	612 Saint James St, Rapid City, SD 57701 iow@hills.net | 605-348-4332 Images of the World Thacker and Junek explore subjects such as social studies, history, science, religion and more via programs — e.g., their World Bicycle Tour across four continents — that promote cultural and ethnic understanding and respect, environmental education and stewardship, intellectual and artistic curiosity, healthy lifestyle choices, goal-setting and the value of pursuing dreams and personal growth through hardship. Independent Scholar	925 S Thompson Ave, Sioux Falls, SD 57103 johntimm@sio.midco.net | 605-338-3312	The Life and Times of Governor Mellette Timm portrays the last governor of Dakota Territory and the first governor of South Dakota. Mellette was territorial governor during a dramatic period of rapid growth and optimism, exciting and romantic as only the Western frontier could be. As governor in the initial years of statehood, he confronted the ordinary difficulties of a fledgling governmental organization: lacking resources and facing economic and political adversity. His troubles were complicated by the high expectations of migrant pioneers lured from the East by land developers. Timm demonstrates how Mellette overcame persistent problems and unanticipated challenges. 101 Marina Bluffs Ct Unit 5, Yankton, SD 57078 vivigard@gmail.com | 402-922-8197	I Shall Miss Bananas Gary Westgard will read from his two books, The Journey and the Grace and At Break of Day, and share recent poems not yet published. He invites listeners to see the sacred in the ordinary, to pay attention to moments of grace in their lives, and to find simple joy in living upon this earth. http://jerrywilson.us 30959 Frog Creek Rd, Vermillion, SD 57069 wilson57069@gmail.com | 605-670-1893	A Nation of Immigrants? Wilson asks questions such as, “Should we fear the ragtag caravan of men, women and children trudging across the Mexican desert as an ‘invasion’?” “Do they pose a threat to our way of life, or are they simply fleeing violence or poverty, some seeking asylum, others a way to feed their children?” His new novel, Eden to Orizaba, is a love story set against the devastation of Mexican families and communities by poorly-regulated, NAFTA-facilitated agribusiness and industry that drives desperate workers north. Wilson reads from the novel, then moderates discussion of the issues it raises and ways citizens might respond. https://sites.google.com/a/usd.edu/norma-c-wilson/ 30959 Frog Creek Rd, Vermillion, SD 57069 Norma.Wilson@usd.edu | 605-670-1843 Rivers, Wings & Sky: Celebrating the Beauty of the Missouri River Ecosystem in Poetry and Visual Art Wilson and her co-author Nancy Losacker will speak about their work focusing on our essential human commitment to the natural world. www.stevenwingate.com	Associate Professor of English, SDSU	1911 Victory St, Brookings, SD 57006 steven.wingate@sdstate.edu | 720-256-8435	So You Want to Write a Screenplay Today’s era is one of visual media, with film and television the most popular form of storytelling. Yet screenwriting, an exacting form with very precise rules, is a mystery to most people who consume the finished product. Wingate takes advantage of his two decades of teaching screenwriting at the college level to boil down the concepts and tools needed to launch a screen project. Journalist	6715 State Hwy 27, Gordon, NE 69343 lillyrae49@yahoo.com | 308-360-9336	Dakota Daughters: Lakota, Euro-American, African American Women from these cultures weave a perceived history of Wounded Knee. Speaking from the past, historical interpreter Geraldine Goes In Center rejoins SDHC scholars Joyce Jefferson and Lillian Witt to revive Dakota Daughters. This historical interpretation of the events culminating in the massacre at Wounded Knee Creek in 1890 has been researched and historically reenacted to display the possible thoughts and feelings of women during that time. www.themarscosaga.com Fiction Writer 227 North Hill St, Marshall, MN 56258	jazarzana@iw.net | 507-532-9117	Getting Started Writing Fiction Zarzana discusses the major parts of writing fiction: plot, characterization, setting. Excellent fiction is driven by developing strong characters with plausible interactions. Plots must be tightly woven and tension-filled, yet believable. This practical workshop, which will develop any writer, will also discuss first-person narration and thirdperson narration. It can be tailored for specific genres, such as science fiction, romance, adolescent or young adult fiction, historical fiction and memoir. By the Numbers: SDHC’s Impact in 2018 Major Grants - 26 Total Dollars - $71,689 Communities Served - 15 Attendees - 16,764 One Stop Grants* - 203 Total Dollars - $58,934 Communities Served - 62 Attendees - 25,836 Rick Mills of the SDHC Speakers Bureau presents "Dakota Railroading: Then & Now" in a 2018 program at the Heritage Hall Museum in Freeman, S.D. Courtesy photo. Gruener is assistant director at Watertown Regional Library and the vice president/ president-elect for the South Dakota Library Association board. A community leader and volunteer, she has coordinated numerous SDHC events at the library, including annual One Book South Dakota discussions and One Book Author Tour events. She is also a contributor to the “LibraryReads” List. She graduated from Emporia State University with a Master’s Degree in Library and Information Science. She became interested in SDHC when she began hosting One Book South Dakota and other SDHC grant-funded events for her community. Hicks is an Augustana University professor and Writer-in-Residence. He is an SDHC Speakers Bureau scholar (see his program information on page 10 of the scholar directory) and frequent Festival of Books presenter since 2006. A former Visiting Fellow at Oxford, he gives fiction and poetry readings throughout the nation, and has written more than 10 books, including The Collector of Names, Adoptable, This London, and the critically and popularly acclaimed The Commandant of Lubizec. Aside from his work appearing on NPR, American Life in Poetry, and the PBS NewsHour, he has won grants from the Bush Foundation, the South Dakota Arts Council, and the Loft Literary Center. The Larson Family Foundation was created in 1990 by Dale Larson, former CEO and President of Larson Manufacturing Company, which is headquartered in Brookings and is the nation’s largest manufacturer of storm doors and storm windows. The Foundation first partnered with the SDHC in 2008 to establish the Center for the Book and has provided major financial support for SDHC challenge initiatives, including strategic contributions to two community foundation incentive programs and the NEH Access Grant for Young Readers — allowing SDHC to meet their goals in the three campaigns. The Larsons created the Foundation to share their good fortune with the people of South Dakota and to help people in need. An enrolled member of the Sicangu Lakota tribe, Marshall III writes non-fiction, novels, short stories, and screenplays. His book The Journey of Crazy Horse was the 2011 One Book South Dakota. In the Footsteps of Crazy Horse was South Dakota’s 2018 selection for the 52 Great Reads list at the National Book Festival. Marshall has appeared in documentaries and the network movie Return to Lonesome Dove, served as technical advisor for several productions, and narrated the six-part miniseries Into the West. A native of the Rosebud Indian Reservation, he taught at the high school and university levels before publishing his first book. He is a founding board member of Sinte Gleska University and splits time between South Dakota and New Mexico. NEH Chair Jon Parrish Peede (left) shakes hands with former Lt. Gov. Matt Michels during Peede’s visit to the Black Hills in July 2018. Photo by Ryan Woodard. a position of delight, of curiosity.” Peede’s visit was coupled with NEH funding workshops by Victoria Sams, Senior Program Officer in NEH’s Education Division. at the Sturgis Public Library, Smith read a poem about childhood that elicited an emotional anecdote from an audience member whose parent had battled dementia. Smith later reflected on connections she made with audience members during the events. She said the group’s reaction to the childhood poem exemplified how poems can elicit a wide range of responses and how a poet learns from intimate conversations with audiences. “So, a poem about childhood can mean so many different things, depending on what the perspectives of the readers are,” she said. “And we heard that today. And many people had experienced that in their own childhoods, and other people said, ‘this reminds me of having a loved one at the end of life who is experiencing dementia who doesn’t recognize me anymore.’ And there were other perspectives that were really surprising to me and that enlarged the poem for me. That’s exciting to see.” American Conversations is Smith’s second-term project as the nation’s poet laureate for 2018-2019. A former Wegner Poetry Fellow at Stanford University who teaches creative writing at Princeton University, Smith designed the program to reach rural audiences and premier the anthology American Journal: Fifty Poems for Our Time. Those who attended the Black Hills events received free copies of the book, signed upon request. Clockwise from Left: Pulitzer Prize winners Timothy Egan and Jacqui Banaszynski; Thomas E. Patterson and SDPB host Lori Walsh; Festival authors Linsey Davis and Joseph Bottum. “If ... they’re trying to reinforce your point of view, you should be highly suspicious of those news sources, because ... their purpose is just to tell you that you’re right all the time.” -14X Pulitzer Winner Martin Baron (above, left) Davis and 2018 One Book South Dakota author Thomas E. Patterson also discussed both past and contemporary journalism. Patterson’s book Informing the News: The Need for Knowledge-Based Journalism, which was read and discussed across the state, argues deeply introspective reporting is crucial to democracy and public awareness. We thank the Andrew W. Mellon Foundation, Federation of State Humanities Councils, and the Pulitzer Prizes Board for their generous support of the “Democracy and the Informed Citizen” Initiative. n 2018, SDHC supporters culminated a three-year effort to meet incentive endowment fund challenges that will boost SDHC’s legacy funding and supported an unprecedented local and statewide philanthropic effort. SDHC brought in an additional $352,000 in permanent endowment funds as a result of meeting three-year goals for incentive funding at Sioux Falls Area Community Foundation, Black Hills Area Community Foundation and South Dakota Community Foundation. SDHC also completed in 2018 a two-year challenge for a National Endowment for the Humanities Access Grant that will provide an extra $200,000 for Young Readers through raised funds and NEH matches to be used in 2019, 2020 and 2021. With the completion of this most recent challenge, NEH has now provided three challenge grant opportunities for SDHC over the last two decades, representing nearly $1 million. SDHC also raised more than $5,170 on Nov. 27 — the firstever statewide Day of Giving — receiving donations in person, online and by mail. Twenty-four people visited to donate, win a prize after spinning our prize wheel and select a book from SDHC’s “Giving Shelf.” Donors also enjoyed coffee, muffins, office tours and camaraderie with SDHC staff members who created the Giving Shelf and provided a warm welcome. Another 22 donated online, while five mailed checks that will support humanities events and activities like the South Dakota Festival of Books. SDHC joined the newly-created South Dakota Gives organization’s effort to unify groups around the state, using hashtags like #forsouthdakota and #southdakotagives on social media throughout the campaign. #BrookingsGives campaign efforts were bolstered by the Larson Family Foundation, which generously matched gifts received from Brookings County residents on Nov. 27. Jerry and Mary Fiedler of Brookings were the first of 24 donors to visit the SDHC office on the South Dakota Day of Giving, Nov. 27. SDHC gave them coffee, refreshments, books and prizes. South Dakota’s first-ever statewide Day of Giving included 400 non-profits statewide and coincided with the national Giving Tuesday movement, which began in 2012 as a way to promote giving rather than receiving during a holiday season besieged with Cyber Monday/Black Friday sales. A special thanks to the donors who donated in person, by mail, and online on #GivingTuesday2018; to the Larson Family Foundation for its remarkable act of philanthropy; and to South Dakota Gives for organizing this effort! 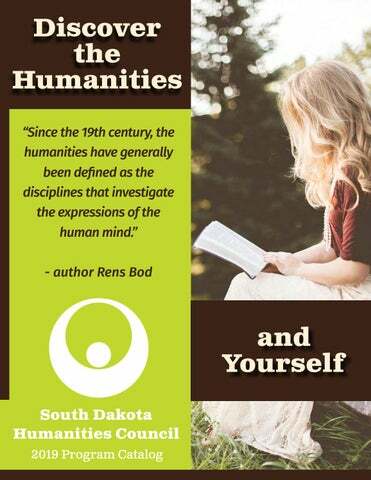 Donate Today Help us bring humanities programs and authors to South Dakota. rom Pulitzer winners to an author who sold more than 5 million copies worldwide of her seminal book, which became a major motion picture, the 2018 Festival of Books featured some of the best writers in the country. Venues were packed with standing-room only crowds lined up to watch Alice Sebold, Caroline Fraser and other featured authors. Alice Sebold speaks to a full house about her book, The Lovely Bones, which was featured on PBS’s The Great American Read list of America’s 100 best-loved novels. SDHC partnered with South Dakota Public Broadcasting to bring the well-known author to the Festival. Peter Jackson and starring Mark Wahlberg. Fraser entertained attentive audiences with inside information about her 2018 Pulitzer Prizewinning biography: Prairie Fires: The American Dreams of Laura Ingalls Wilder. Other highlights included presentations from experts on journalism and democracy (see page 19), Boston Marathon winner and author Amby Burfoot, Pulitzer Prize winner Annette Gordon-Reed (The Hemingses of Monticello), and 2018 Young Readers One Book Author Kara LaReau (below). LaReau brought thousands of third graders to their feet to kick off a successful Young Readers Festival that also featured popular children’s authors Laura Geringer Bass, Joseph Marshall III, Michael Hall and more. The following individuals and organizations — listed by donation totals ­— gave to the South Dakota Humanities Council during our Fiscal Year 2018 (Nov. 1, 2017 - Oct. 31, 2018). Thank you to these many generous donors who make possible South Dakota Humanities Council programs and events, including our largest event, the South Dakota Festival of Books. sdhumanities.org/give The SDHC is a 501(c)3 nonprofit organization, funded through a combination of grants from private and public sources and large and small gifts from individual donors. Donations are tax-exempt. 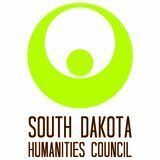 he South Dakota Humanities Council maintains a board of South Dakotans who set policy, provide guidance and determine programming goals and missions. The board is composed of volunteers with varied backgrounds who perform various duties. In addition to meeting three times a year at locations throughout the state to help guide SDHC policy and programming, board members often volunteer their time to help at events like the South Dakota Festival of Books. Pictured at left is board chair Vonnie Shields introducing 2018 Young Readers One Book author Kara LaReau at the Washington Pavilion in Sioux Falls last September. Shields assumed her chair duties at the November 2018 board meeting. *Four members of the Council board are appointed by the Governor. Information about South Dakota Humanities Council programming, including the Festival of Books, One Book South Dakota and more!